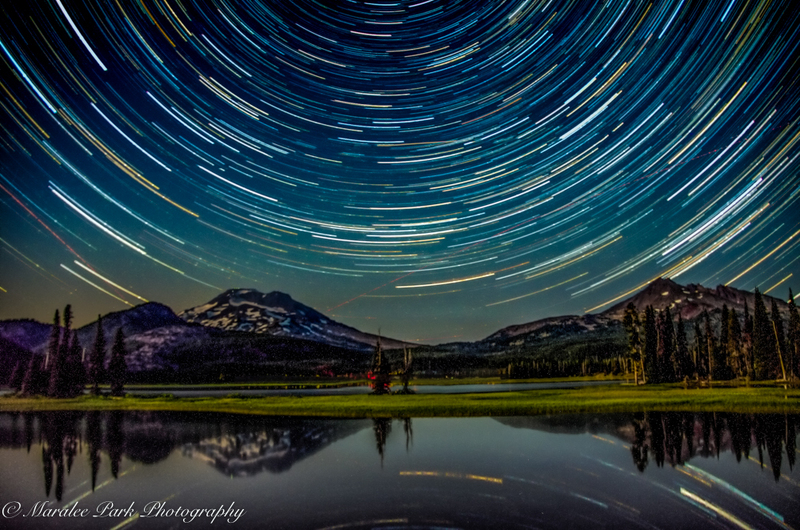 Saturday night I went with the local photography meet-up group to photograph the sunset and star trails at Sparks Lake. Although there was a little smoke from a nearby wildfire on the horizon, it didn’t detract from the stars. It was a crystal clear night and perfect night for photography. There was a quarter moon setting behind us which gave enough light to illuminate the foreground. This was my first attempt at star trails. And you just get one shot (unless you have multiple cameras or want to stay up all night). This star trail shot consisted of 120 photos taken over an hour – 30 second exposures with a one second interval in between. This is where the intervalometer is essential. I bought this one at Amazon for about $22. You can click on it for a link to Amazon. It is available for most camera makes and models. I spent a little time learning how to use the intervalometer – it’s really quite simple. On your camera you set your shutter speed to bulb, the aperture to the smallest you can, and experiment with the ISO. I had mine set at 1600. A wide-angle lens is also necessary. Mine was set at 18mm. Then you set the intervalometer to the length of the exposure (mine was 30 seconds), the interval between shots (mine was set at 1 second), and the number of photos you want the camera to take (I set mine at 120 which meant a little over an hour). You can set it for as long a 399 photos. It’s a good idea to take a few test shots before starting the intervalometer so you know if you have to adjust the ISO setting. Then you just sit back for an hour and wait for the camera to finish taking the photos. I downloaded my photos into Lightroom and made synchronized adjustments to the photos before exporting them to a folder on my desktop. Then I processed the photos in a free download called StarStaX. It’s easy to use and processes the photos quickly. While this was only my first time trying this, I was happy with the results. Next time I might go for more exposures. In any event, I had a lot of fun doing this. It’s great, Maralee! I want to take some shots in two weeks because of the Perseiden. I hope the weather will be fine. Unfortunately I only have one hour till moonrising. I’d love to try photographing the meteor showers but right now we have so much smoke in the air we can’t see anything. This is a pity! But for that you have the chance to photograph beautiful sunrises and sunsets. I hope the situation will get better! I have a similar piece of kit but have never had the patience to us it. And I worry that my computer might not have the memory to cope with the multiple pictures. Your result was very exciting. I learned how to use my by watching youtube videos. You can learn so much on youtube. I keep my photos on an external hard drive so my computer doesn’t get overloaded. Thank you very much, Bo.